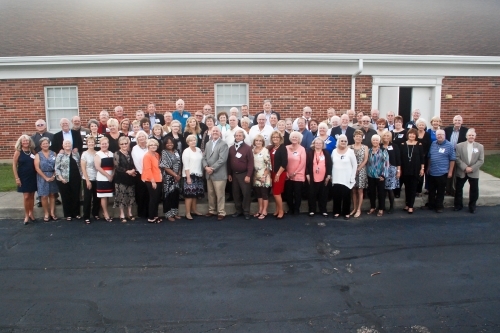 The 50th Class reunion was held on September 12th, 2015 and was a huge success! After 18 months of planning, working the little details, meeting after meeting at DLM, developing our letters, printing, doing the mailings, numerous mass emails, classmate address searches, updates to our mailing list, site selection, contracts, the list seems endless, but the entire crew pitched in and did what they could. It could not have happened without the dedicated crew. After a lot of effort we have added all of the pictures (both that have been received and were taken by MotoPhoto) to our Photo Album page. If you have taken some you wish to share, please send them to me (joe@theweBB.net) and I will get them included. We had a nice Memorials tribute to our classmates that have passed and multiple tables of 1965 Memorabilia. Murl Huffman, Dean Pond, Ron Bingamon and Dave Cooper all gave humorous comments. LLoyd Cooper brought up some old signed underwear for a huge laugh. Joe Gavin gave a poignant look back over 50 years of things that we did, saw, lived through or emphatically denied we ever did. (Well that's my story and I'm sticking to it!) He touched on highlights that seemed to be well received (Full Text). Steve Shade acted as the MC for the night and kept things going smoothly. We have created a Memorials page for our classmates that have passed away. If you know of anyone that we have not included, please send us the information and we will put them on the Memorials page. Please see the Memorials page for the latest information. We have also created a Where's Waldo page as a central place to post information on classmates we can't locate. Again, if you have information on the missing classmates, please let us know! Keep watching the Events and Calendar tabs for time and place for upcoming gatherings. You are all welcome to join us at El Rancho Grande on Alex Rd at 5:30pm on Thurday nights.